If static and dynamic elements come together in a scene, one can create eyecatching effects in an image by slowing down the shutter speed. Moving clouds appear as washed out stripes in the sky and waves turn into softened mist. In landscape photography ND 1.8 (6 stops) and ND 3.0 (10 stops) filters are very popular because in twilight situations or when the sun is low on the horizon they deliver appropriate exposure times in the lower range of minutes. 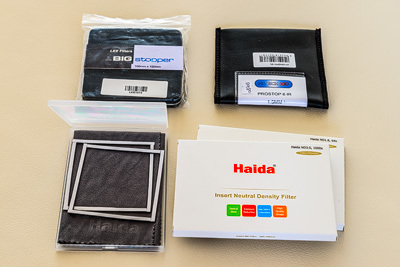 My preferred filter supplier HAIDA has recently started to sell an ND filter with incredible 15 stops of light reduction (ND 4.5 or 32000x). This filter is intended for use in bright daylight, as by example it extends the exposure time of 1/125 second to 4 minutes and 22 seconds. Neutral density filters (also called ND filters or greyfilters) are an indispensable tool for achieving special visual effects in landscape photography. Exposure times can be significantly extended and moving image content becomes washed out. With ND filters you can blur moving water, passing clouds can be turned fuzzy and long exposure times may even eliminate moving people from the scene.